"One of the most luxurious buildings in the Gold Coast, the Waldorf Astoria Residences sit on top of the Waldorf-Astoria Hotel (formerly known as the Elysian Hotel). With only 51 units in the condominium portion of the building, only a few units are for sale in the building at any given time." 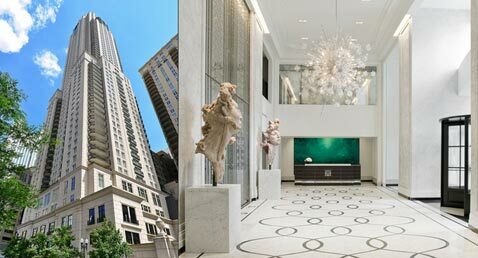 The Waldorf Astoria Residences at 11 East Walton, designed by Lucien Lagrange Architects, is one of the premier luxury residential buildings in Chicago's Gold Coast neighborhood. Situated in one of the most desirable locations in the city, this beautifully designed property features lavish homes built to accommodate the finest tastes. Residents of Waldorf Astoria Residences can enjoy luxury amenities such as a 14,000 sqare foot deluxe spa, indoor pool, concierge services and valet parking. Condos at 11 East Walton spare no expense with 180 degree views, 10 - 12 ft. ceiling heights, hardwood floors, fireplaces, first-class kitchen appliances and private terraces. 11 E Walton is also a pet friendly building with indoor parking available.